At the heart of UWC’s distinctive model of education is deliberate diversity. Extending across the entire community, this is a vital component to every UWC school and college. All students will benefit from learning in a diverse environment that helps to broaden their mind and sense of self - alongside gaining an internationally recognised qualification. We help students discover the possibility of change. They learn that they can help to change the world through their courageous action, personal example and selfless leadership. We support young people to reach their intellectual, moral, aesthetic, emotional, social, spiritual and physical potential. What students learn is guided by seven principles, which represent our commitment to educating the person as a whole. They are underpinned by the pursuit of peace, sustainability and social justice, our founding aim. Education should take place within a diverse college community. Students should be selected from regions and social groups that reflect the wide range of tensions among and between people. Education requires active promotion of intercultural understanding and the development of genuine concern for others, founded on shared life experiences, and cooperative and collaborative living. This includes talking about and engaging with global issues in the pursuit of peace. Physical fitness and a healthy lifestyle are integral to developing a balanced person. Unhealthy lifestyles limit human potential. Community interaction is at the heart of college/school life. This requires the full and active participation of all members of the school or college. Students should be able to take positive action around issues of sustainability on both an institutional and individual level. Students must have opportunities to practice personal initiative, self-discipline and responsibility, and to manage risk and embrace challenges. Where appropriate, these opportunities need to be supported by a reassuring adult presence. Recognition is given to the fact that individuals possess unique talents and abilities. Programmes should exist in each school/college which help students fulfil their potential. All of our schools and colleges share the UWC mission and values, but each operates differently, with a distinct local and regional identity. 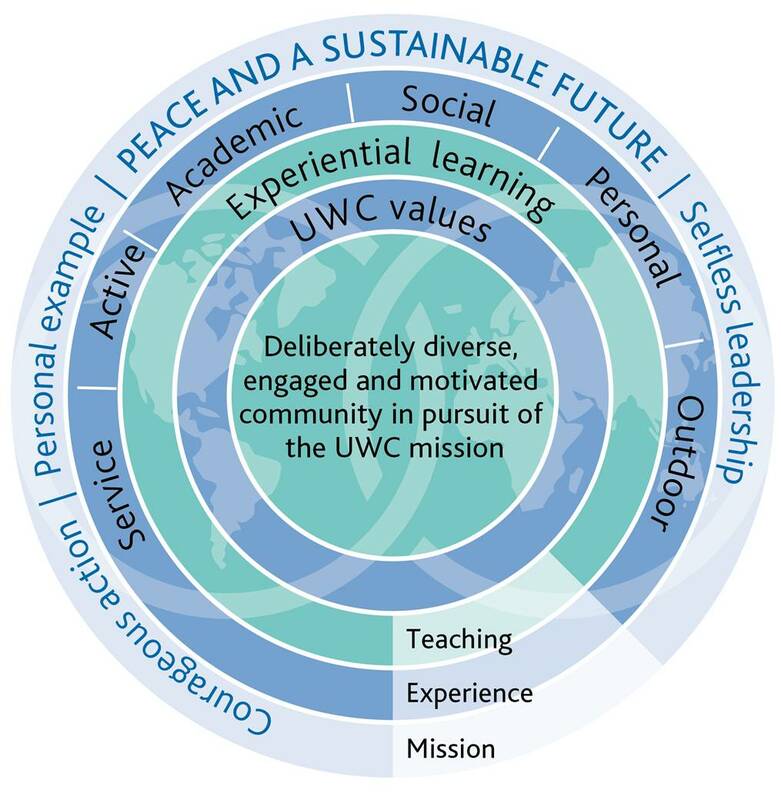 The UWC educational model provides a common framework within which all of our schools and colleges operate. It does not set down a curriculum but focuses on what is unique about UWC’s approach to education.